b) 9% additional rise the following month straight after the May 2015 general election, to £74,000. Note while Shapps, the Tory party chairman, was being characteristically slippery none of the other three MPs on the panel, from Labour, Liberal Democrat and UKIP stepped in to clarify this. 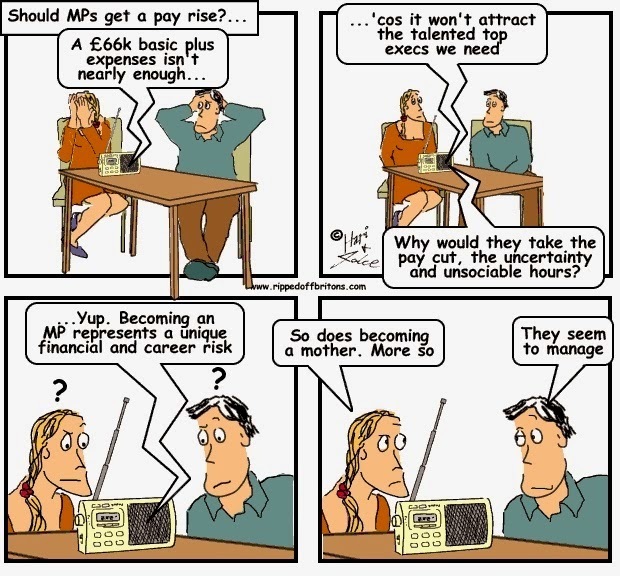 We have in other posts pointed out that an MP's basic salary is more than the wages of 95% of UK taxpayers. However, putting aside all the expenses and all the 'under the radar' consultancies and directorships, MPs have plenty of opportunities to bolster their incomes with funds from Parliament itself. According to the Parliament website, there are plenty of other paid jobs, from Prime Minister to Assistant Whip. The list of posts as at March 2015 included 121 individuals holding 146 jobs (a small number of which are unpaid). "In 2010 there were 137 MPs employing family members but the figure soared to 167 last year. 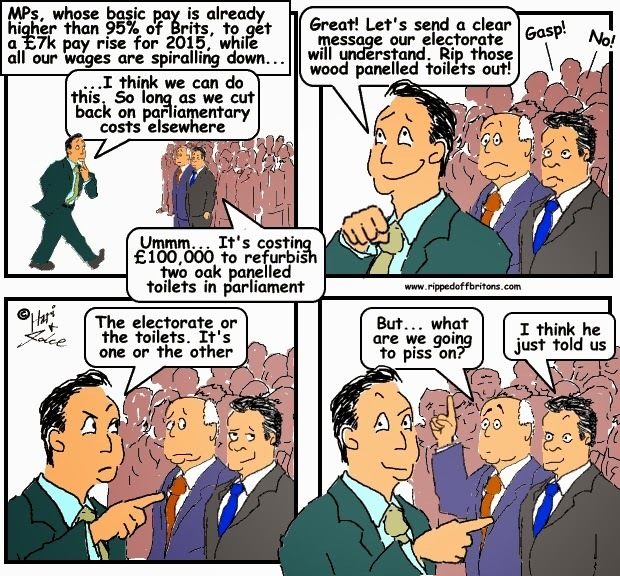 The total pay bill has rocketed from £2.4million in 2010-11 to almost £3.8million in 2013-14. It means that the average salary paid to family members has risen by a third, from just over £17,101 to just over £22,400." The distribution of salaries paid to family members is shown in the graph below, for the year 2013/14. [If you want it, the data is here: http://www.parliamentary-standards.org.uk/AnnualisedData.aspx. For 2013/14 it is there in the "other data"].